NextHistory Painting: The Crusader army attacks Constantinople by Jacopo Palma il Giovane, circa 1587. Publicly the build up for Sun Cycles has been calculated since mid-January when Jessica first teased fans of her new project. All we knew back then was that it was going to be steeped in deep synth, big drums, and soaring vocals. With the recent release of her debut single Kids, its fair to say Jessica Hottman doesn’t disappoint. The one thing that often most intrigues me about Jessica Hottman is that she is very good at what she does. Over the course of her career so far, she has reinvented herself and her sound with wonderful results. With that in mind I reached out to Jessica to talk about Sun Cycles and that amazing heart wrenching new single Kids. Last year when we spoke I recall you saying that you were looking forward to The Hottman Sisters Louder tour. Seven months later you are now stepping out on your own! It’s a big change. What has been the allure of going solo? It has been very exciting stepping out on my own. I am the songwriter for both The Hottman Sisters and my new solo project, Sun Cycles, so in that way the projects feel similar – they are both me writing music ha. But Sun Cycles is also unique in that it is more synth driven with a gritty and haunting vocal at the crux of each song. I began working on this solo project last year, even as I was releasing music and touring with The Hottman Sisters. I love both projects so much and to me, they are different outlets for my creativity to flow through. Sun Cycles is not about leaving behind The Hottman Sisters, but is another project where I can let my songwriting come out in a different way. Right now, Sun Cycles is the focus, as I am releasing new music and touring. I love the inspiration and story behind your new project Sun Cycles. The analogy you draw between your music and it being this tiny piece “of all the beauty that our world is creating: a thread in the quilt that humanity is weaving” is pretty cool. Do you still feel the same way since you said it? Thank you! I do still feel this way. With technology advancing, we are able to witness art, music, film, etc., from all over the world. This can be overwhelming and oversaturated at times, but I also love it, because it is humbling as an artist. There are so many other humans making wonderful works of art and I am really just a piece of all this beauty being put forth into the world. At the end of the day, I want to remain honest in what I am putting forth, no matter how “small” it is. I want my thread to be true to me and a legacy that makes sense with who I am. I want it be authentic. As always I see you are still pushing the envelope and writing music that is outside of the box. Your new single Kids sounds like a real statement where you would like to go musically? In truth it is not too dissimilar to The Hottman Sisters Louder sound. Thank you again! Kids was the catalyst song that really started this whole Sun Cycles project. I debated releasing it as the first song, because it is a very raw piece that almost touches into ballad territory, which can be a risky first move. But in the end, this is what made it the perfect single and the right song to release as the window into my new project. It is a bit of a boundary push in a beat heavy, I have 10 seconds to “win-the-listener” world, but I felt like I wanted to dive more into the deep end with this debut song and see if anyone was willing to go with me in that. I am definitely writing in the pop world for this new project, but it’s like pop with a twist. Something a little darker and a little deeper. 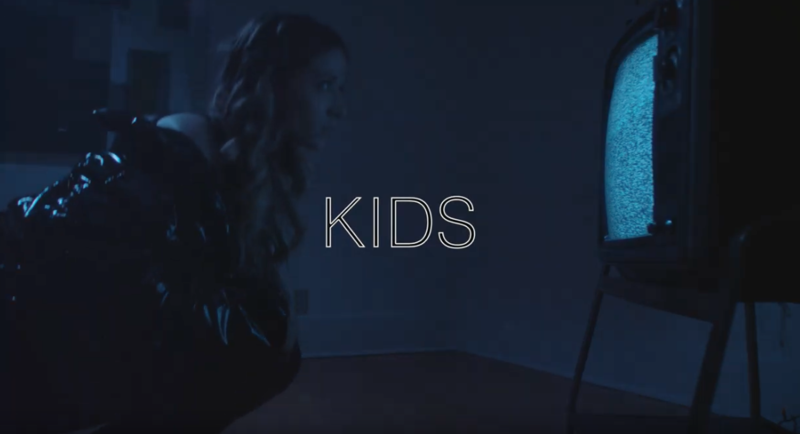 Your new single Kids explores an array of themes associated with childhood and youth. I was hoping you could tell me something interesting about its evolution? Did it turn out exactly as you hoped or did you surprise yourself at the end of writing it? Kids was originally a song about losing a relationship with a loved one, but as I began working out the lyrics and video concept, the song took on an even broader shape. The theme became about more than just losing a relationship, but watching the innocence of childhood slip away – something very human that we all experience. And even though we try to fight the hands of time, it isn’t something that we can control. The song was originally written on electric guitar with different verses and a more upbeat feel, but I scratched that version to make it a synth ballad. I wanted the song to cut more to the core. I remember thinking, let me just try this out on a bass synth with some fresh lyrics. As I sang out this new version at the top of my lungs with the low bass synth rumbling, I remember tears rolling down my face. I knew in that moment it was a good decision. More recently, I understand you were deep in the studio working on your new EP. What can fans expect to hear with your forthcoming solo release? I have been working diligently on a new EP. This EP is my heart and soul and I am very excited to share this different side of me – a more mature side. I am trying to push my own boundaries as an artist and I think fans can expect to hear that come through in the music, particularly in the vocal delivery. The EP does have a pop feel but it’s more accurately a sampler platter that shows the many facets of my songwriting. I don’t like to stay in one box when I listen to music, so I don’t stay in one box when I write it. We will endeavour to keep you posted as new announcements filter through about Sun Cycles forthcoming new EP. In the meantime, check out Sun Cycle’s new single Kids via Spotify. Follow Sun Cycles on Facebook and Instagram. Photo credit: The header image of Jessica Hottman is courtesy of Sun Cycles and Brett Radin at Zero Management.